BARACK OBAMA IS NOT going to miss the chance to get big Jewish bucks for his campaign. 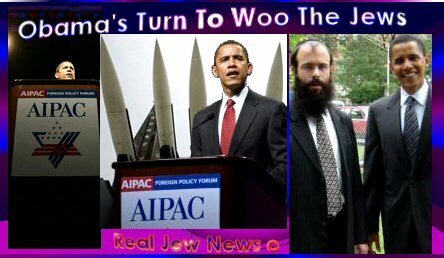 That’s why at his June 4 2008 speech to the American Israel Public Affairs Committee (AIPAC) in Washington DC, Obama over-exerted himself to outdo McCain in wooing the Jews. — “Today I am among friends who share my commitment to make sure that the bond between the United States and Israel is unbreakable today, tomorrow and forever. Those who threaten Israel threaten us. I will bring to the White House an unshakeable commitment to Israel’s security. As president, I will provide $30 billion in military aid to Israel over the next decade. The Iranian regime is pursuing a nuclear capability and its president denies the Holocaust. (So what? BN) The danger from Iran is real and my goal will be to eliminate this threat. I will do everything in my power to prevent Iran from obtaining a nuclear weapon. Let there be no doubt: I will always keep the threat of military action on the table to defend our security and our ally Israel. Sometimes there are no alternatives to confrontation. This is the change we need in our foreign policy. Change that restores American power and influence. Aren’t We Fed Up With This Nonsense? Let’s Tell The Jews & Their Patsty Candidates To Stop Destroying Our Nation Now! I wonder if Obama has ever seen images of the Ukrainian holodomor of 1932-33, the Soviet-engineered famine that deliberately killed a comparable number as died in the Holocaust. The walking skeletons, the desperation cannibalism, town after town of dead bodies. Does he know it was imposed mostly by Jewish ideologues not unlike the audience to which he was speaking? Does he know that many Jews have worked to bury (deny) this history, and the larger history of Jewish Bolshevism and its murder of millions more in order that Jewish ideologues could continue with their murderous ways? Does he care? I doubt it. Dead Ukrainians and Russians don’t give small fortunes to presidential campaigns and Congressional candidates, but living Jewish ideologues give plenty. And they get plenty in return, things such as a blank check to quasi-fascist Israel, the Iraq war, and the nascent war against Iran–to which Obama seemed to be warming in his speech to the Jewish lobby. This kind of despicable hypocrisy canâ€™t and wonâ€™t stand much longer, not in the age of the internet. Smart people get on the right side of history–and as far away from the Judeofascists as they can scramble. Why would anybody want to follow a tribal network that leaves nothing but death and destruction in its wake? I guess every man has his price; Obama, Hillary, and McCain certainly do. But in the end, it wonâ€™t be worth it, even for them. Although Obama is always described as being a “Black”, as I have read somewhere, his genetic makeup is actually only less than 7% African, the rest being a more or less equal mixture of Caucasian and Arab. I wonder if He is aware of the special contempt that Jews have for the Arab race (like “human excrement” as Menachem Begin put it), and the somewhat less than equal status accorded in Israel to the Falasha Jews of the Ethiopean diaspora merely for having dark skins. P.s. I see that I have inadvertently elevated Obama’s status by referring to “Him” (with a capital h). 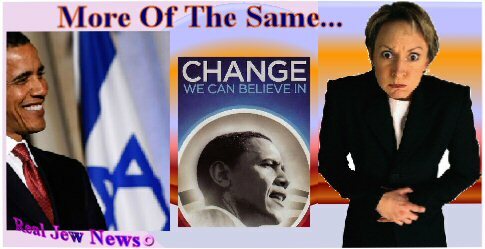 To make things clear, I am not an Obama worshipper, it was an editing mistake. Not that it matters in the big picture but Mr. No Flag (because its silly) addressed the AIPAC with a twin flag pin on. It is clear that “the system” is so locked up that Change will not really be possible from the top down. In order to change the gridlock in government, there will have to be a change from the bottom up: That means Christians being true to their Faith, studying history in full (not revisionist history), and Living the Christian lifestyle — rejecting Sin, by pronouncing it when they see it and visibly living its polar opposite. Our kids will not listen to what we say unless we DO what we say. Politicians will not listen to what we say unless our actions defy what secular humanists attempt to do to destroy this Christian nation. Somehow, as a Christian nation, we have to find a way to Boycott all that Secular Humanism is selling to us. Christians are Long Overdue to have their own Film Industry. Christians are Long Overdue to have their own Cable Industry. Christians are Long Overdue to have their political parties and advocate groups. Where are all the Lobbyists insisting in the halls of Congress to have a Christian agenda in our public schools. Our Constitution promises Freedom from the intervention of government into the affairs of religion. NOT the other way around, as has been misconstrued by the ACLU. In many ways, Christians are like sheep being led to the slaughterhouse. We instinctively know our government has been usurped — and yet, we continue our self-denial that things will CHANGE without our active participation. To that I would say: Dream On. Well Just another Devil here and Zionis SUpporter!!!! WHAt change?? This Evil foreign policy has been st many years ago!! What has happend to peoples minds??? Truly the Lunatics have overtaken the Asylum, One Evil Lunatic will leave only to have another one Fill in. Are American People so docile as to have to even listen to this contempious crap!! It’s so Sad that a bucnch of real lunatic are ruling the world!!! but for how long, ODnt dare think that the Almighty Creator is keeping account on all fronts!!! THe creator is never Unminbdful of what these evil people do, it’s only in GOd’s own time will he sort them out and mighty is he in meeting out Justice!!! Come on Wake up people !! Its not like he was going to address AIPAC and tell em he was going to shaft them if elected. Fact is, his backround makes him the most likely candidate on offer, who will, maybe, short out the so called Third Rail of American polotics. And just maybe, if he does, you Yanks can make sure that in the future, you dont get to be held to ransom by 2% of your electorate ?? give Obama a chance. Putin was a KBG agent, then he turned on the Jews who most likely gave him that job. Nobody believed, not even Jew Yeltsin, that Putin would do what he did, that is why that half breed Jew-Armenian Kasparaov is all up in arms. None of the Jews knew! That’s the game we need to play, the same game Jews play on us. We Armenians are doing that to, through, http://www.noplacefordenial.com analagous to JEW RUN noplaceforhate. @David: Actually, you’re the one who doesn’t understand what is going on. Obama promising US$30,000,000,000.00 per year for the next 10 years to the Final Solution project of the elites while Americans are in bread lines. The money is funny money coming from City of London. But funny or not, it would not be coming to a bankrupt USA unless it was ear-marked to go you know where. Its a money laundry process: it wouldn’t look good for the City of London to keep giving free credit to their project. Also, there remains the added benefit that while the money was going to be given to the zionist regardless, now the Americans are holding the bag for *borrowing* the 30,000,000,000,000.00 from the money lenders and will be paying interest on it. But don’t kid yourself. If America is to break free, it must also learn to do without the financial crack-heroin mix of fiat currency based on credit from City of London. Because, the fact is, it won’t be available to a Free US of America. The Armenian Genocide was carried under the orders of the CRYPTO JEWS. In India, the genocide of the Indians by the British after the East India Company in 1857 was on the orders of a Jewish company. The genocide of ZULUs in Rhodesia was carried by CECIL RHODES using the Rothschild advice and MAXIME Jewish machine guns. Know your enemy properly. It seems we keep trying to talk to Jews, without realizing Jews are truly insane people, that are willing to corrupt others to kill people for the crime of not being born a Jew. Although the USA Constitution guarantees ‘freedom of religion,’ it is supposed to stop the use of USA tax dollars, weapons and Soldiers to enforce the religious insanity of anyone, even Jews, on to people who are only guilty of not being born a Jew. It’s time for the USA military to march into Washingjew DC and forcibly remove ALL of ‘our’ politicians, put them on trial and let them explain how they became millionaires. If found guilty of treason, selling USA to anyone, even the Jews, they should be punished to the full extent of the law, usually by firing squad or by hanging. As to the Jews themselves, those that believe ‘god’ chose them and gave them Israel, send them to their homeland, they are not happy in America, but no more USA weapons, taxes or soldiers to protect them. Now the Jews would have to do their own fighting, let’s see how much them cowards really want that piece of crap land that ‘god’ gave to Jews. USA = idiots. Jews = cowards. Arabs = victims of idiots and cowards.